It was a good game, hard fought with lots of good plays and a victory at 1-0. I thought it was going to be a wipe out because the other team was short a player (Our coach tried to get a volunteer to switch so we could have a full set of players on the field, but no one woud go) and it started badly. However, they warmed up quickly and it was hard fought from then on. Jack managed to score early in the second half to put the team ahead. Several of the kids had excellent drives at the goal but were stopped by good defensive plays. Corwin put up a good defense himself, with several good tackles and kicks. Interestingly, the other team’s primary problem was a lack of offense (something I have seen Corwin’s team have troubles with as well). All of them would congregate on their side of the field during defense, so that if someone did get the ball away from the goal, it would just come right back. This was fortunate as Corwin’s team was playing too far forward, where a strong break away by a good dribbler would have put the goalie in serious trouble. 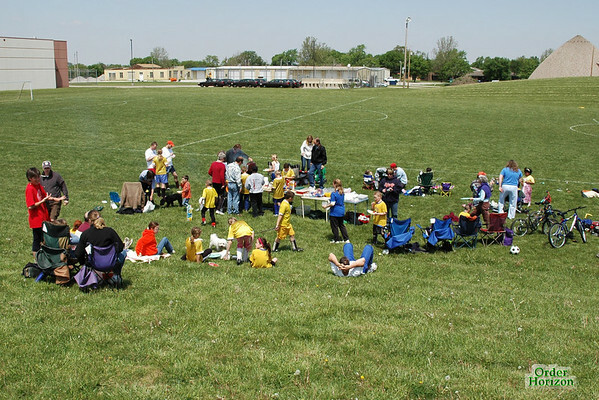 Afterwards there was a picnic for the team and parents. We had a game of parents vs. kids and unlike last season, the parents won. The key was having the game right after tiring the kids out with a hard fought regular game. That’s the kind of thinking that keeps us old folk in the game. I would ike to note that we had help from Jack, who managed to score on his own team. As for me, I hit a personal best of 899 pictures on the day, with a little help from Corwin’s baseball coach from last year. An excellent end to the season.